Once again diagrams from The kusudama. I have assembled the arabesque however since it’s a bit small I don’t know how, or with what, I’m going to curl it; so last night I attacked the neglected paper I had and voilá! :) Even though it’s a bit too much blueish it’s still very cute in my opinion. 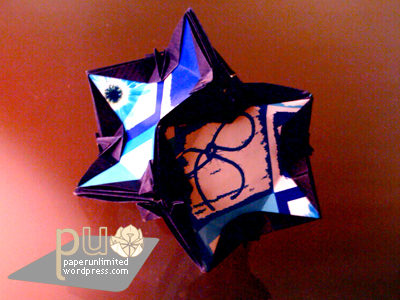 This entry was posted on 2007|01|30 at 15:52 and is filed under kusudama, modular origami. You can follow any responses to this entry through the RSS 2.0 feed. You can leave a response, or trackback from your own site.